Malbec, once a mere blending varietal with a minor role in red Bordeaux production, has proven to be extremely (no pun intended) well-suited to elevations of 4000+ feet above sea level, in the mountainous region of Mendoza, Argentina. 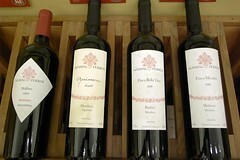 It is at vineyard sites such as Finca Mirador, Bella Vista, and Altamira that the some of the world’s greatest Malbec is produced, and today Achaval-Ferrer is regarded one of Argentina's finest wine estates. This Friday we will be featuring new releases from Achaval-Ferrer, including two of the single vineyard Malbecs, their multi-vineyard Malbec, and their Malbec-inspired take on the Bordeaux blend "Quimera."